Who is Santa Fe Tennis & Swim Club? The Santa Fe Tennis and Swim Club provide tennis and swimming experience in a beautiful backyard like environment. With each court standing alone, the setting alongside Sun and Moon Mountains is unsurpassed. This relaxed atmosphere provides the perfect venue for families and tennis enthusiasts to play hard at the pool or on the courts. The intimate neighborhood like setting and limited membership level allow us to offer the personalized customer service, our clients have come to expect. Where is Santa Fe Tennis & Swim Club? What industry does your business represent? Mainly our business represents the tennis industry. As our pool is seasonal, swimming is not as heavily represented, however it is our second main focus. Also we represent the health and wellness industries, as fitness is a main component of each of these fields. Consequently, we are a part of the health club industry. In fact, many health and fitness clubs are tennis clubs from the 70’s that have survived by growing to become fitness and racquet clubs. What is your best selling product/service and why? Our best selling product is membership. The aesthetic experience of playing our sport and swimming in this relaxed park like setting is unique and intangible. This safe, bucolic environment for kids and adults is conducive to learning many of the life lessons tennis has to offer. 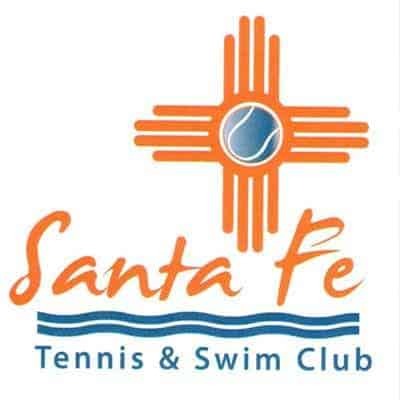 The Santa Fe Tennis and Swim Club have been in business since January of 2014. The facility was Old Santa Fe’s first tennis club, established in 1967. How would someone find your business online? What keywords would they search for to find you? Tennis, tennis clubs, tennis lessons, tennis camps, summer camps, swimming and swimming pools. Our main target demographic is middle class and above. Young families are of particular interest as growing the game for future generations is crucial for the success of the sport, and for our business. Also, tennis has such long standing historical traditions, that many retired people learned the game early in their lives and enjoy staying fit in retirement by playing tennis. Santa Fe and our east side has many people who fit this mold. Another main target audience are visitors to the tourist destination that the city of Santa Fe is. Our web presence is one of the best ways for visitors to find us when they come to town. El Gancho Fitness Swim and Racquet Club – Probably our main competitor. Their facilities are bigger and more diverse than ours. 2 indoor courts, 7 outdoor. 2 pools…1 indoor, 1 outdoor. Huge fitness room with cardio center and high quality weight machines, spinning room, spa treatments. They have more than 1000 members…perhaps 1500-2000. 200-300 are tennis members. This volume of people is one thing that underscores our quaint low key setting. Some folks want exactly this type of high energy atmosphere, while some appreciate the more serene feel of our facility. Location – South east side of town, 4.8 miles and 15 minutes from the plaza. Shellaberger Tennis Center – Built in 2002, this 6 indoor court and 1 outdoor court facility has around 300 members. As an indoor court facility, they charge membership dues as well as hourly court time fees for all courts. While a beautiful architectural accomplishment for our sport, the indoor aesthetic does not allow us to revel in the outdoor beauty and temperate climate that we love about Santa Fe. They have the only full service pro shop in town with top quality racquets and shoes in stock, as well as some clothing. Location – Near geographic center of town, on campus of Santa Fe University of Art and Design, 3.4 miles and 13 minutes from the plaza. Las Campanas – This upscale residential residential development is centered around a country club with 2 Jack Nicholas golf courses and a full service fitness center, indoor and outdoor pools, spa, and 7 outdoor synthetic clay courts, as well as 2 restaurants. Location – North side of town, 11.6 miles and 25 minutes from the plaza. Is your company involved with any charities or non-profits? At the Santa Fe Tennis and Swim Club, we support charities and non-profits in a few different ways. Our Ancient City Adult Open makes a donation each year from our sponsor EarthStone International, to the Santa Fe Community Foundation’s Partner4Schools program. This program benefits Santa Fe’s Public schools, by funding grant requests for projects that teachers make on behalf of their classes. If not for private funding, these are endeavors that the school district cannot pay for. We also make donations to local schools, public and private, as they engage in fundraising auctions and the like. We typically offer camps, lessons, and membership items to these sorts of events.